The Times-Gazette’s Sharon Hughes is shown Monday morning preparing to welcome guests to the open house celebrating the newspaper’s 200th anniversary. Everyone is invited to join us today (Monday) for our open house celebrating The Times-Gazette’s 200th anniversary. Please stop in anytime at 108 Gov. Trimble Place in Hillsboro to enjoy some food, cake and sign up for door prizes. We also have a one-day-only Customer Appreciation Special for current subscribers to extend their subscriptions for an extra 13 weeks for just $18.18, in honor of the year we were founded. It’s a savings of nearly 50 percent off the regular rate. Also, anyone ever affiliated with the newspaper is invited to join us at 6 p.m. for a family portrait to be taken in front of our office. Hope to see you here! 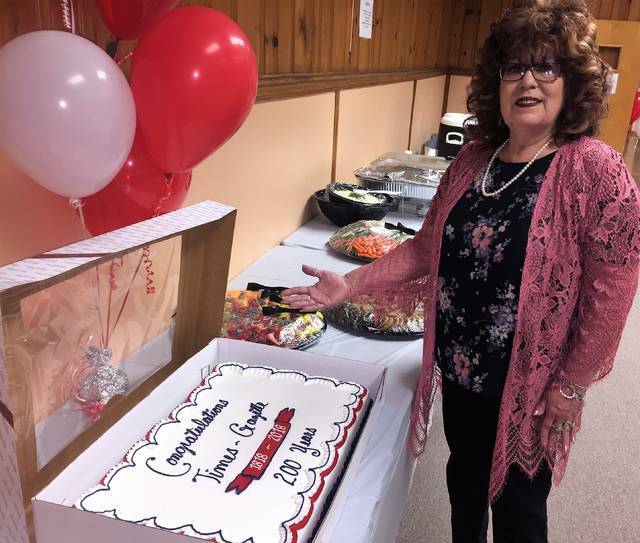 https://www.timesgazette.com/wp-content/uploads/sites/33/2018/06/web1_Sharon-cake-final.jpgThe Times-Gazette’s Sharon Hughes is shown Monday morning preparing to welcome guests to the open house celebrating the newspaper’s 200th anniversary.